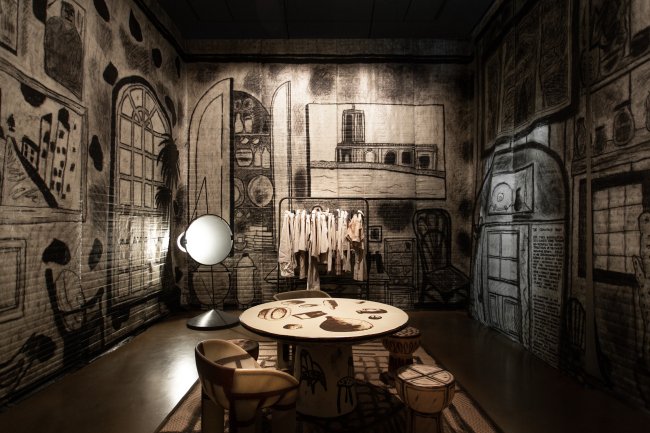 The latest exhibition at D Museum’s Hannam-dong branch, “I Draw” comes with 13 sections that have incorporated various design elements in line with the works of art displayed in each space. The 13 sections are designed by architect Kwon Kyung-min. Two local companies, COM and Craft Bros, have designed the interior details to match the mood that each section has. Some of the sections are also accompanied by different scents and background music. Local perfume and cosmetics company Tamburins has added eight fragrances, and Space Oddity has selected five sound works for a few sections. “We tried to incorporate other elements into the exhibition for a better art experience,” the museum’s chief curator Kim Ji-hyun said during a press conference held Wednesday at the gallery’s Hannam-dong venue in Seoul. The colorful combination of various elements into gallery space makes distinctive demarcations between sections, which includes 350 works by 16 artists here and abroad. The exhibition starts with a room that introduces drawings and paintings by Eom Yu-jeong. Next to Eom’s section is a space decorated with a number of arches painted in sky blue. On view are drawings by Pierre Le-Tan, a Paris-based artist who is internationally known for his contributions for the covers of the New Yorker magazine. 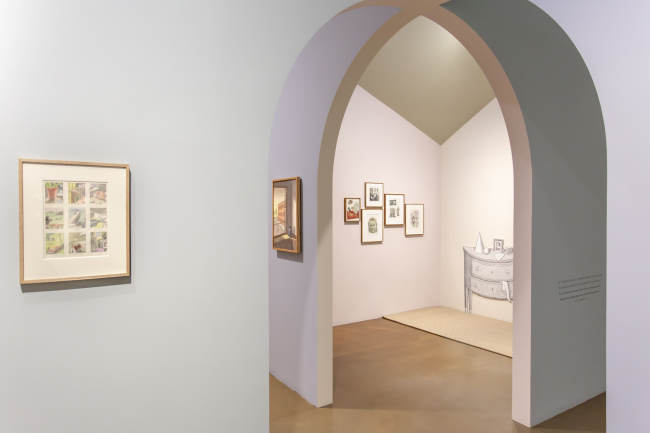 The room shows recent drawings from his series titled “The Collection of Monsieur X” and “An Interieur de Fantaisie” (“Interior of Fantasy”). Walking deeper into the museum space, viewers encounter the hemisphere of Japanese artist Hajime Sorayama. The room presents the artist’s paintings and an installation of a humanoid robot accompanied by a backdrop of electronic sounds. London-based artist Katie Scott’s room reminds museumgoers of a botanical or zoological garden. The black walls are decorated with plants and animals from the books “Botanicum” and “Animalium,” in which the artist contributed illustrations. The section also includes animation “Story of Flowers,” a collaboration by Katie Scott, animator James Paulley and flower artist Azuma Makoto. The 3 1/2-minute video shows the lifecycle of exotic flora. “Visitors are allowed to explore different types of visual artworks ranging from drawings and illustrations to animations and installations. We hope the exhibition can help visitors find their own taste and inspirations to express on their own,” curator Kim said.